27 weeks doesn't sound very long! 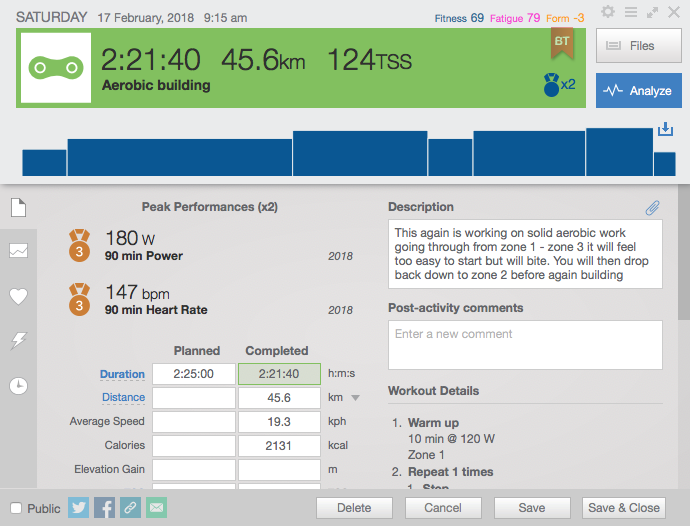 Though that is 26 more of these new weekly updates (you lucky readers) where I'll update you on my training for IronMan Wales, and let you know which apps I have been using and how they have done. My current fitness is reasonable but I've been knocked back a little with some family crisis (my mum was critically ill, but has thankfully since recovered, had a pacemaker fitted, and is now back at home) and a couple bouts of illness (one which hit me for six on the first ball on Sunday), but life never actually gets out of the way and you have to train around it. 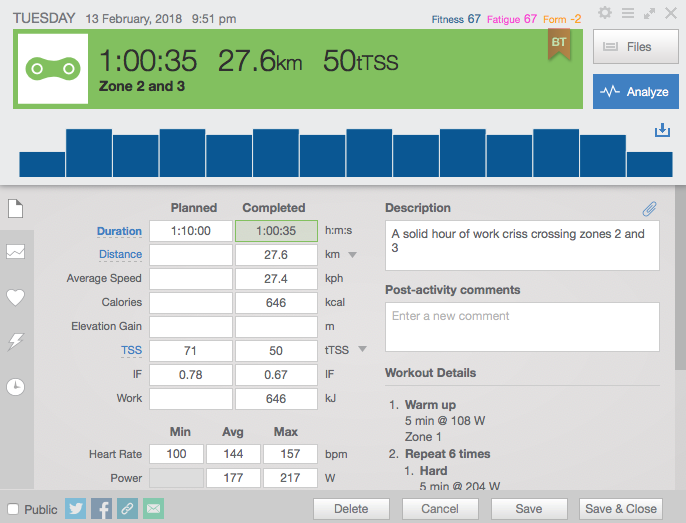 When these things happen John, my coach tactfully reminds me that recovery time is important and that the stresses of life will have an impact on your performance, so I try to bear that in mind. 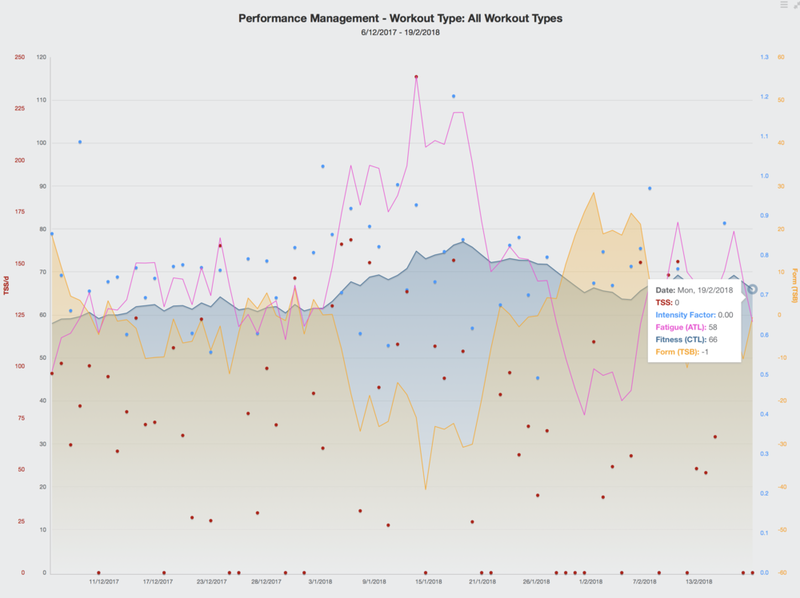 Below is how Training Peaks currently has me in the performance management chart - the blue area is my fitness level (66), the yellow area my form (-1) and the purple line is fatigue (58). I like this chart because it gives me a nice overview of progress, and in additional as you add planned training you can see where you may end up. It's a bit like the Fitness and Freshness chart Strava have for premium members (which I suspect they sort of copied from TP), but is the original and the best IMHO. I think it could be improved though, because It only logs what you export into it. Wouldn't it be nice if it hooked into the Apple Health App and got all day stats on your resting heart rate, vo2Max, and more and made intelligent use of it to produce more accurate charts? HealthFit does now export some of that data but it only really shows up independently in TP and is not used in analysis. Anyhow looking at that chart you can see I have lost a bit of fitness this month, but there's plenty of time yet really to keep pushing that fitness line up so I feel ok. For comparison on the start line for IronMan Maastricht Aug 6 last year my fitness was 77, fatigue and form were both at 36, and the day after collapsing on the finish line fitness was 90, fatigue was 123 and form was -51. The highest I have hit for a fitness figure was after completing The Raid Pyrenees on my bike in June 17 where I had fitness of 114, fatigue of 199 and form of -91. Quite a hard week - though I did ride through the clouds which was excellent (yes this is me in the picture below), and I would recommend it to anyone who fancies a cycling challenge with glorious routes and scenery. I'll dig more into the TP values in future blogs though you can read a lot on them on their web site. So how did this week break down in terms of what I did? Wednesday: Surge intervals on the bike. Was feeling quite fatigued for this. It might have been the start of the cold that hit me at the weekend, or maybe just the long day on Tuesday. Same setup as Monday in terms of how it was logged. Thursday: Some strength and conditioning and a swim at the local pool and gym. Used Apple Watch and the Workout app to log both. Since I used Apple Watch Workouts for the swim, and it doesn't support drills, the log for that wasn't great, so I added it manually to TP. I am still switching between the Swim.Com app and the stock Workout app for swimming. I need to do further testing. Friday: A threshold run with 10 intervals based on heart rate - so 2:30 in zone 4 then 4 mins easy. I often do this route or something like it to run to the Gymnastics club where my youngest daughter does her training on Friday and I meet my wife there. Double bonus because it's mostly downhill to the club and I get a lift back :). I used iSmoothRun on Apple Watch but also had my iPhone with me. Turns out in the current release iSmoothRun is much nicer if you have iPhone with you, because it can give you spoken stats on your intervals (this didn't happen when I used it standalone on Apple Watch). Review of iSmoothRun coming soon. Sunday: On Saturday night I started getting a bit of a stomach pain, and then had an unsettled night with little sleep. Felt awful as I woke up, and really in poor state to attempt the planned 2hr 20 run (which I was actually quite looking forward too, since it was a lovely bright crisp day). I managed a 30min walk with my wife in the afternoon, but it was so leisurely Apple Watch didn't even log it as exercise! I think you need an elevated heart rate even if you start a Workout. Darn! Slept an awful lot during the day, but still got 8hrs sleep Sunday night. Monday: The stomach pain has gone though I'm still blocked up with a bit of a headache, though this is a rest day so that's fine, and I am confident I'll be able to get back to it tomorrow.